Expert witnesses are relied upon in court proceedings to issue objective opinions, having no allegiance to one party or another. The main role of an expert witness is to make a presentation of clear cut facts, based on generally accepted principles in their field of study. It is not the responsibility of the expert witness to attempt to persuade a judge or jury into making conclusions about a case. The highly skilled and experienced professionals at P4 Security Solutions have been recognized for many years as experts in such diverse areas as public safety, municipal law enforcement, private sector security and management operations. In addition, our vast partner network can offer medical expert witness testimony, as well as other professional disciplines of study. Our team can work with your legal counsel for the purpose of litigation preparation or to deliver sworn testimony in open court. 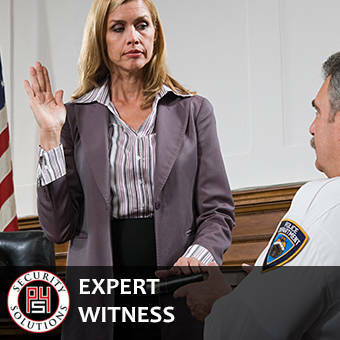 You can count on the seasoned professionals at P4 Security Solutions to provide the finest expert witness services the security industry has to offer.